...or, barring that, to at least get you to click on a headline. First a disclaimer: I never lost my own personal faith in humanity, and therefore don’t need to have it restored. Generally speaking, it bumps along at about the same cautiously optimistic level, regardless of what I’ve recently read online. I am, however, fascinated by the fact that so many articles published over the last couple of years have introduced themselves to prospective readers by declaring their power to restore lost faith in humanity. Journalists, of course, have always written headlines which attempt to yank you by the lapels and shove you into their work, as Annalee Newitz of io9 points out in her recent history of clickbait. (She begins it in 1888, and rightly considers yellow journalism to have been an early instance of the form.) But the potential upside of that instinct grew far more powerful just a few years ago, when social networks such as Facebook and Twitter became major sources of traffic to online content sites. All of a sudden, even interesting headlines were competing with an essentially limitless quantity of other interesting headlines being shared by millions of real people online. Being interesting–or at least theoretically interesting–became a baseline requirement. And many headlines began upping the ante by promising some sort of explicit payoff. Unlike someone such as infomercial king/jailbird Kevin Trudeau, creators of clickbait aren’t going to claim that their work can, say, cure cancer. So the promised payoff of most headlines was emotional. Even if the claim is made with tongue planted at least partway in cheek, it’s tough to imagine many emotional payoffs more dramatic than restoring a reader’s lost faith in humanity. Promising to restore faith in humanity stands out for another reason: It suggests that the content in question is good for you. On a Web that’s bulging at the seams with (wildly popular) empty calories such as photographs of uncomfortable cats and Kardashian explainers, faith-restoring clickbait featuring kindness to strangers, underprivileged people, animals and assorted other beneficiaries says it’ll make you a better person. You can click without guilt–and hey, you might even feel guilty if you don’t click. In other words: If cats and Kardashians are Doritos, restore-your-faith-in-humanity stories are Pop Chips. How long has this been going on? Rummaging around in Google Books, I found a prehistoric example of the claim in a little ad which the Durham-Duplex Razor Co–a company which is still in business–placed in magazines such as Popular Science and Popular Mechanics in 1930. It boasted that Durham-Duplex blades–anthropomorphically depicted as a doctor attending to a patient–would “restore your faith in humanity,” apparently after it had been shattered by the false promises of other companies’ razors. It’s exactly the same sort of genially hollow claim which journalists would make about their work more than eighty years later–and a helpful reminder that headlines are a form of advertising, especially on the Web. But as far as I know, it didn’t start a trend. In January 2011, BuzzFeed ran a video about one young baseball fan graciously tossing a ball to another with the headline “If This Video Doesn’t Restore Your Faith In Humanity, Then I Don’t Want To Know You.” At this point, the reference to faith-in-humanity restoration sounded more like a threat than a promise. 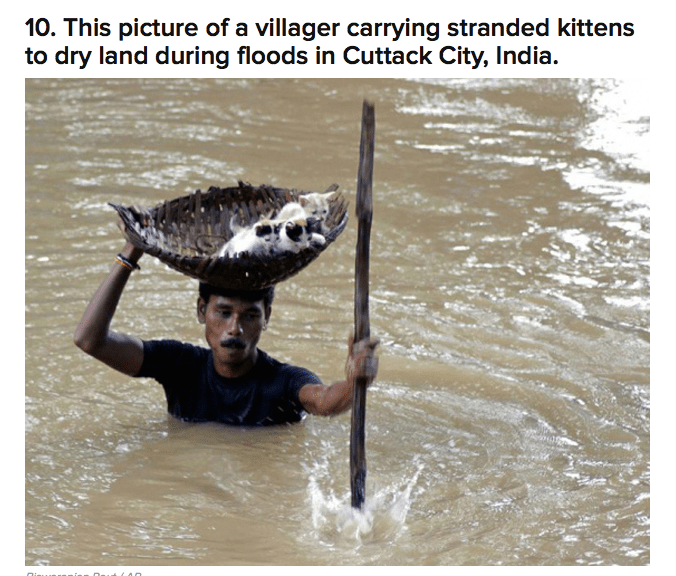 In September of that year, NedHardy.com published “7 Pictures That Will Restore Your Faith in Humanity,” the first instance I can find of a listicle unequivocally making that promise. Then in January 2012, Mashable’s Sarah Kessler wrote about a video-hug site under the title “Restore Your Faith in Humanity at the Nicest Place on the Internet.” In this case it was a call to action, falling short of a guarantee. On May 29, 2012, NedHardy.com published another piece, “13 Pictures to Help You Restore Your Faith in Humanity.” This time, the site wasn’t bold enough to promise that its photos of nice people doing nice things would restore your faith in humanity. It just said that they might be a step in the right direction. Less than a month later, on June 20, BuzzFeed’s Jack Shepherd offered up “21 Pictures That Will Restore Your Faith in Humanity.” It was based on the same theme as NedHardy.com’s features and featured some of the same images, while bumping up the quantity of material. But it was on one of the Web’s highest-profile engines of viral content. Boom! Shepherd’s piece was a monstrous hit–the site’s second-most popular story ever as of September of that year. To date, it’s been viewed more than fifteen million times. 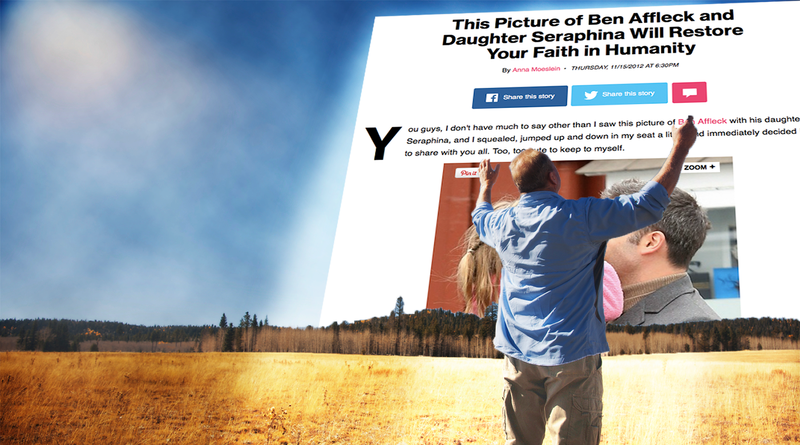 As for the rest of the Web, it’s endlessly imitated Shepherd’s “21 Pictures” listicle–sometimes using the same faith-restoring photos which appeared on NedHardy.com before Shepherd posted them. Now, I’m not completely cynical about the intent of all of these pieces. If you’re feeling jaded about your fellow homo sapiens, reading about them performing small kindnesses for each other might indeed buck you up. But the thing is, the more that online articles have talked about restoring faith in humanity, the less the claim–Barnumesque though it was in the first place–has meant. Even once you’ve weeded out openly unserious examples like a post promising that watching Vanessa Hudgens twerk will restore your faith in humanity, you’re left with scads of items which make the claim based on nothing more than a cute photo or video. Children singing a song from It’s Always Sunny in Philadelphia? They’ll restore your faith in humanity. A photo of Ben Affleck allowing his kid to poke at his face? He’ll restore your faith in humanity. Tom Hanks posing with a fan who’s pretending to be drunk? He, too, will R.Y.F.I.H. 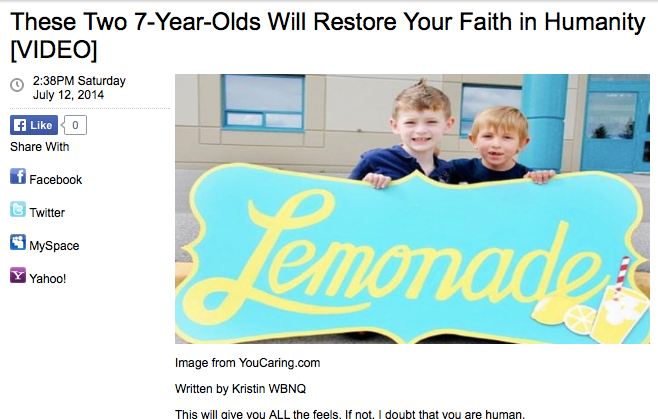 Basically, promising to restore someone’s faith in humanity has become a nervous tic: Something you append to a headline on a story concerning something at least mildly cheery when you’re not sure it sells itself and can’t think of anything original to say. The more people who have done it, the sillier it’s gotten; at this point, it’s so trite that I can’t imagine it induces many people to click on something they’d otherwise ignore. Which is not to say that sites have given up: In just the past few days, they’ve covered two seven-year-olds, some African park attendants, and a painter of NSFW Disney characters who will…well, you know. But I can see the day coming when this meme joins “all your base are belong to us” as a reference which brings to mind an era on the Web which has come and gone. That leaves me worried about one thing. If restoring somebody’s freaking faith in humanity is no longer a sufficiently potent promise for a hastily-assembled collection of borrowed images to make, what could possibly be next? With humanity behind us, I need my faith of alien civilizations restored. I detest this sort of clickbait. Same goes for the “You won’t believe what happens next” style of headlines. They’ve made FaceBook a much less enjoyable place. With that, my work is done today.